“Our international expertise with regard to seafood benefits our local customers,” says Louise Haahjem, Head of Seafood at Nordea Bank. Nordea is a Nordic bank whose market is the entire North Atlantic. Its international expertise is particularly valuable in an industry such as seafood. Today’s Nordea includes the former regional banks Sunnmørsbanken, Sørlandsbanken, Fiskernes Bank and parts of Vestlandsbanken. This provides local roots and insight into the history and development of an international coastal industry that without doubt has the future before it. With such roots along the entire coast, it is not surprising that Nordea’s customers include fishermen as well as seafood producers, processors and exporters. This provides a fundamental understanding of the challenges experienced in every section of the value chain. Nordea has dedicated seafood departments in Bergen, Ålesund and Oslo, and staff with seafood customers in Trondheim, Bodø and Tromsø too. “Nordea aims to be a dependable bank that seeks close relations with its customers, that knows seafood and understands risk management. We also aim to be a constructive and knowledgeable sparring partner, with expertise on both the banking and seafood sides,” says the bank’s Head of Seafood Louise Haahjem. Nordea Bank’s fisheries section has a staff of nine. 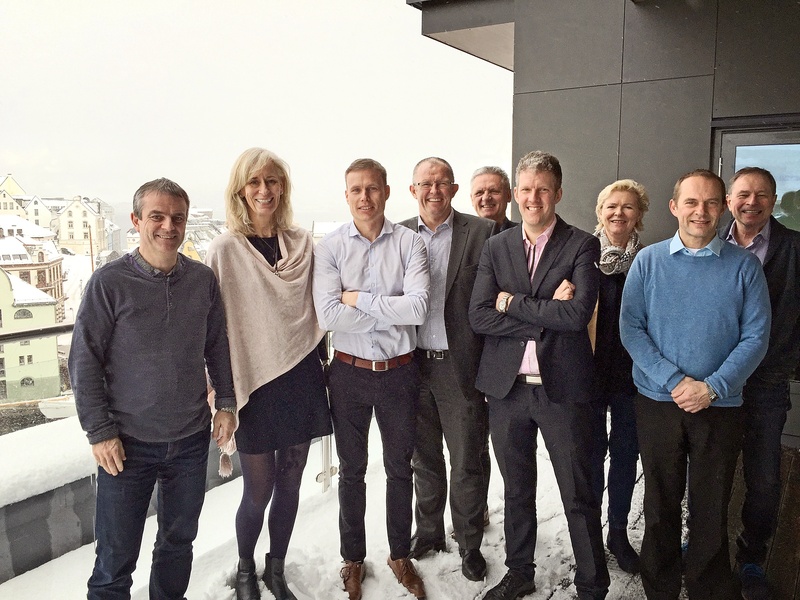 From the left: Erik Godvik (senior relationship manager – SRM), bank director Louise Haahjem, Johan Myklebust (SRM), Helge Fiskeristrand (SRM), Freddy Larsen (SRM), Finn-Arne Egeness (seafood industry analyst), Inger Sønderland (SRM), Eivind Mortensen (SRM) and Jens Victor Sele (SRM). The bank’s presence in Bergen is particularly valuable because Norway’s West Coast region accounts for 56 per cent of the country’s total value creation in the marine sector and over half of Norway’s marine research and development activities. At the same time, several of the major international seafood groups are headquartered in the city. This local presence offers access to a wide range of expertise and a valuable and knowledgeable network. “Nordea has industry analysts who monitor the global seafood market every single day, and who update clients on development trends in both the raw materials and consumer markets as a natural part of our dialogue with our customers,” says Louise Haahjem.